I grew up with my father making fun of woman drivers... but his sexist remarks were nothing like what happened on this day in 1990: Fourteen brave woman drivers -- who were accompanied by thirty-two passengers -- lodged an unusual protest in Riyadh, Saudi Arabia. The women pulled out of a Safeway supermarket parking lot, driving only a short distance before police and devout Muslim men stopped them at a traffic light. While the Muslims beat on the windows, accusing the women of being prostitutes and sinners, the police began the arrest process. They took the protesters to the local police station for interrogation. Then, rather than have them be stoned by men, the authorities released the women into the custody of their male relatives for punishment. Yes, those were the good-ole' days of woman rights for everyone... before organized religion regained its death-grip on the movement. 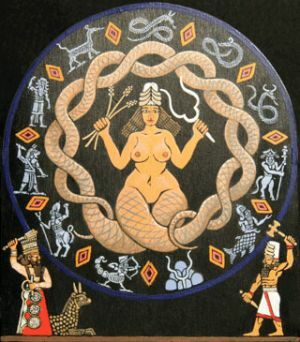 In Babylonia, this day was celebrated as the birth of the goddess Tiamont, who, with her consort Apsu -- she needed a driver -- created heaven and Earth and gave birth to all the gods and goddesses of the ancient world. Wow... look how far we've come.